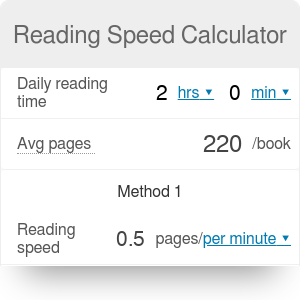 Reading speed calculator helps you assess how many books you will read in any specific period. Reading has been steadily popular around the globe for a few generations already. Although the number of printed books is dropping slightly every year, more and more people purchase e-book readers such as Kindle, Nook or Kobo. Even more, according to the study by Pew Research Center, read e-books on their tablets or smartphones (or more like phablets). Reading won't go away for quite a while it seems and it's no surprise as some of the most successful people on the planet claim to owe their success also to having read tons of books. If you have a large pile of books you'd like to read you'd certainly like to know how long, approximate, it might take. This is where our calculator might be useful. To make it easy for you to make some estimations we added 2 methods of calculations so choose the one that suits you best. The first one takes into consideration the speed of reading an average page of a book. If you're able to determine that, insert your value or use the default one (we found out it takes on average 2 minutes to read a page but it depends heavily on the actual book and your speed). Once you insert the value you'll quickly see how many books you might be able to read. The second method uses the popular words/minute indicator. If you don't know yours use one of the various online tools that will help you estimate it and insert it into the calculator. On average we read at the speed of 250-300 words per minute with ~60% comprehension. Average book will have around 250-300 words per page but the number might vary if it includes illustrations or is written in very large or small font. Check it yourself or use the default value. Once you insert both, the tool will return your approximate number of books read. It's hard to say which method will be more accurate, please feel free to check yourself and let us know! Reading Speed can be embedded on your website to enrich the content you wrote and make it easier for your visitors to understand your message.